If time is money, then why are you throwing away dollars on wasted time and inefficient business practices? When your irrigation schedule works with QuickBooks, you can schedule faster and smarter. 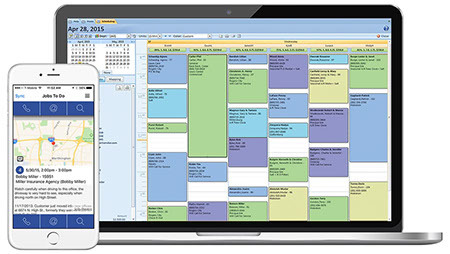 Irrigation scheduling software keeps your company organized and communicating effectively, getting you to the job faster. When you run an irrigation business, oftentimes many other businesses rely on your work to be able to do theirs. Irrigation scheduling software automatically populates work orders with information from QuickBooks, then puts them on the schedule in the most optimal place! Eliminating double data entry cuts down on wasted time and gets your technicians to the job hassle-free. Thought the best irrigation scheduling software stopped at scheduling? Think again. Smart Service dispatches too, allowing your irrigation business an all-round efficient system! The Smart Service mobile app brings the power of the office to the hands of your technicians on-the-go. From scheduling to work orders, your irrigation business technicians can go to their jobs fully prepared. Access customer information, forms, and job notes through your mobile device or tablet! You can even collect payments and signatures! The best part? This is all sans paper, so you don’t have to worry about damaged forms or illegible handwriting. You already know and love QuickBooks. Irrigation scheduling software adds another level of functionality to an already-great system. Smart Service uses QuickBooks for customer information and equipment data to make your work orders more complete. You can even create easy estimates for customers on the job! After your job is complete, simply turn that existing work order into a ready-to-bill invoice and you’re good to go! Find out why Smart Service irrigation scheduling software is a perfect match for your business. Request a free demo of Smart Service now! Looking for more ideas on how to grow your irrigation business? Check out these articles!